Vitamin D functions in the body through both an endocrine mechanism (regulation of calcium absorption) and an autocrine mechanism (facilitation of gene expression). The former acts through circulating calcitriol, whereas the latter, which accounts for more than 80% of the metabolic utilization of the vitamin each day, produces, uses, and degrades calcitriol exclusively intracellularly. In patients with end-stage kidney disease, the endocrine mechanism is effectively disabled; however, the autocrine mechanism is able to function normally so long as the patient has adequate serum levels of 25(OH)D, on which its function is absolutely dependent. For this reason, calcitriol and its analogs do not constitute adequate replacement in managing vitamin D needs of such patients. 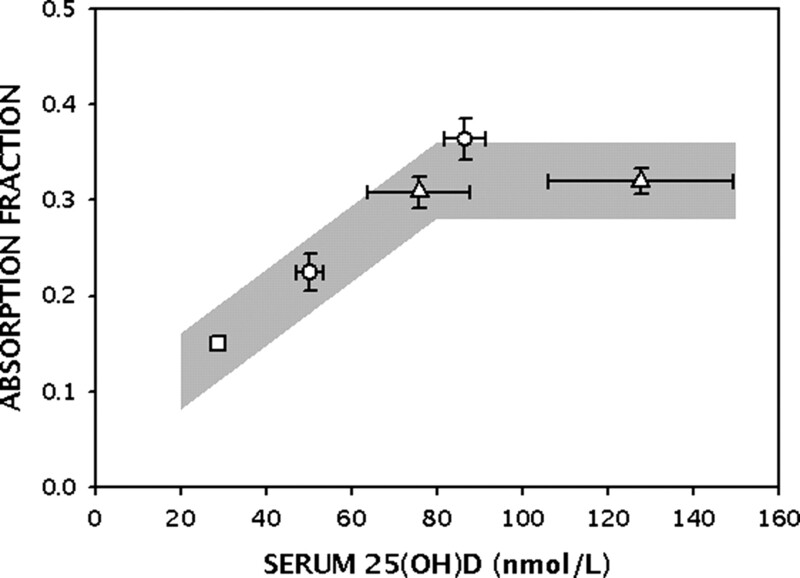 Optimal serum 25(OH)D levels are greater than 32 ng/mL (80 nmol/L). The consequences of low 25(OH)D status include increased risk of various chronic diseases, ranging from hypertension to diabetes to cancer. The safest and most economical way to ensure adequate vitamin D status is to use oral dosing of native vitamin D. (Both daily and intermittent regimens work well.) Serum 25(OH)D can be expected to rise by about 1 ng/mL (2.5 nmol/L) for every 100 IU of additional vitamin D each day. Recent data indicate that cholecalciferol (vitamin D3) is substantially more potent than ergocalciferol (vitamin D2) and that the safe upper intake level for vitamin D3 is 10,000 IU/d. Investigation of the effects of vitamin D and its metabolites and analogs has literally exploded in the past 10 yr, leading to substantial revisions in understanding of both the mode of action of vitamin D and the extent of its role in the functioning of a still growing number of body tissues, systems, and organs. Figure 1A illustrates the canonical scheme of vitamin D action that prevailed at the time when the most recent dietary intake recommendations for the vitamin were promulgated (1). In this scheme, vitamin D input to the body (whether cutaneous or oral) resulted in conversion to 25-hydroxyvitamin D [25(OH)D] in the liver, with subsequent conversion of 25(OH)D to calcitriol [1,25(OH)2D] in the kidney. Calcitriol functioned as a hormone, circulating in the blood to stimulate the induction of various components of the calcium transport system in the intestinal mucosa. The net result was that active calcium absorption was increased and the efficiency of calcium absorption, normally low, was augmented so as to enable controlled adaptation to varying calcium intakes. This scheme remains correct, so far as it goes, but it is now understood that many tissues, particularly components of the immune apparatus and various epithelia, are able to express 1-α-hydroxylase and to synthesize calcitriol locally, as depicted in Figure 1B. The upper right-hand branch represents the endocrine pathway, and the lower branch represents the autocrine pathway. There are three key features of the revised scheme: (1) The bulk of the daily metabolic utilization of vitamin D is by way of the peripheral, autocrine pathway; (2) among other effects, the autocrine action always results in expression of the 24-hydroxylase; as a result, locally synthesized calcitriol is degraded immediately after it acts, and, thus, no calcitriol enters the circulation; and (3) local concentrations of calcitriol required to support various tissue responses are higher than typical serum concentrations of calcitriol. In the cells and tissues that are the locus of the autocrine pathway, the synthesized calcitriol serves as a key link in the signaling apparatus that connects extracellular stimuli to genomic response. It has become clear in recent years that many tissues possess the proteins, enzymes, and signaling molecules that they need only in virtual form (i.e., encoded in the DNA blueprints in the nucleus). When the cells of such tissues are exposed to an extracellular stimulus or signal that calls for them to mount a response that requires some of these proteins or catalysts, they do so by opening up their library of DNA blueprints, finding the ones that are appropriate for the situation, and then synthesizing those proteins by transcribing the information that is encoded in the DNA. Figure 2 illustrates this process, showing specifically the key role played by intracellularly synthesized calcitriol. When bound to the vitamin D receptor and a variety of other helper proteins, calcitriol seems to be just the right key to open up the locked stores of DNA information, allowing the cell to transcribe the plans and produce the proteins needed for tissue-specific responses. The helper proteins that are a part of this complex determine the region of the DNA that will be transcribed. Without vitamin D, the ability of the cell to respond adequately to pathologic and physiologic signals is impaired. For example, the ductal epithelium of the breast requires vitamin D to mount an adequate response to cyclic variation in estrogen and progesterone (2). Also, macrophages use vitamin D to enable the synthesis of the bactericidal peptides needed to deal with bacterial invaders (3). In addition, most of the epithelial structures in the body, which turn over relatively rapidly, use vitamin D to signal the transcription of proteins that regulate cell differentiation, cell proliferation, and apoptosis (4). There are several consequences of this revised understanding. Perhaps most important is that this scheme permits tissue-specific action of vitamin D (as contrasted with what would otherwise be near-universal activation if all tissues were directly responsive to circulating calcitriol concentrations). A second key insight is that the 1-α-hydroxylase in the tissues concerned functions well below its kM (5); hence, the amount of calcitriol that it can produce locally depends on the availability of the precursor compound [i.e., 25(OH)D]. 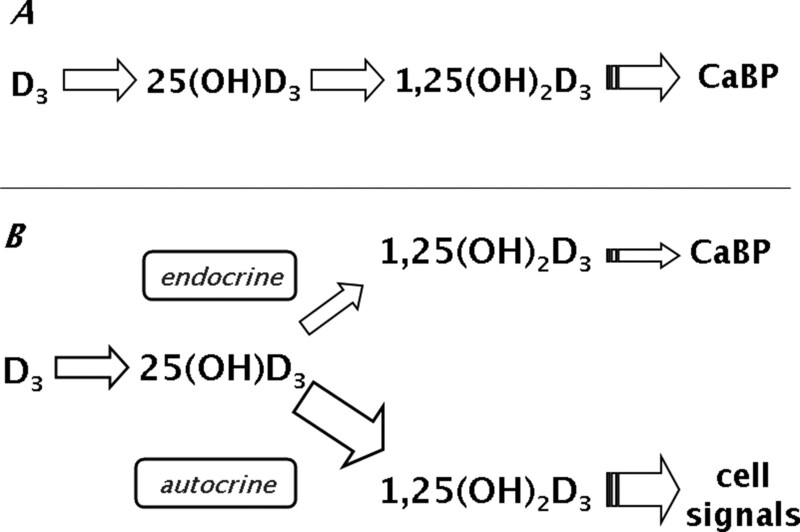 Thus, serum concentration of 25(OH)D becomes a critical factor in ensuring optimal functioning of the various systems that require vitamin D as a part of their signaling apparatus. Until recently, it had been customary, in the management of ESRD, to supplement patients with calcitriol or one of its analogs—a logical move, given that renal synthesis of calcitriol in such patients is effectively knocked out. The resulting serum concentrations of calcitriol, however, are generally too low to enable the autocrine functions of the vitamin. Also, because of the short biologic half-life of calcitriol, serum calcitriol concentrations in such patients tend to be low most of the time. Finally, replacing calcitriol increases metabolic clearance of 25(OH)D (6) and certainly does nothing to support normal serum levels of this key metabolite. Thus, calcitriol is not a replacement for vitamin D and, at best, functions solely as a poor replacement for its endocrine function. The inadequacy of calcitriol as a substitute for vitamin D itself is further emphasized by three lines of evidence indicating that even the canonical function of vitamin D (facilitation of calcium absorption) cannot be achieved by calcitriol alone. (1) Without doubt, calcitriol is the principal regulator of calcium absorption in typical adults, but it has been recognized for many years that those with frank vitamin D deficiency (e.g., adults with osteomalacia) exhibit calcium malabsorption, despite frequently normal to high-normal levels of circulating calcitriol. This defect is corrected not by giving more calcitriol but by raising serum levels of 25(OH)D. (2) Furthermore, 25(OH)D, administered as such, has been shown to elevate calcium absorption efficiency in typical adults, and it does so without elevating serum calcitriol levels (7). (3) Despite high parenteral dosages of calcitriol (e.g., 2 μg intravenously three times per week), calcium absorption efficiency remains severely depressed in patients who have ESRD and are on renal dialysis (R. Lund, personal communication). A working conclusion is that the optimal regulation of calcium absorption requires both molecules [25(OH)D and calcitriol]. How 25(OH)D is functioning in this setting is unclear, but it may be through binding to membrane vitamin D receptors (8) that, in turn, open calcium channels in the enterocyte and thereby facilitate the transfer of calcium across the cell. Patients with ESRD, particularly those on renal dialysis, tend to be sick and spend little time outdoors and often have sufficiently dark skin to impede efficient vitamin D synthesis on sporadic sun exposure. For these reasons at least, serum 25(OH)D concentrations in such patients tend to be suboptimal and, in many cases, frankly deficient. Moreover, as is widely recognized, such patients have a very high excess mortality rate and increased risk for many chronic diseases. Whether the vitamin D deficiency that is common in such patients contributes to these risks and to their poor quality of life remains to be determined. The canonical function of vitamin D, described briefly in the previous section, is the facilitation of calcium absorption through the endocrine pathway of Figure 1. Figure 3 illustrates the relationship of absorption fraction in healthy adults to serum 25(OH)D, showing a plateau effect at serum 25(OH)D levels of approximately 80 nmol/L (9). Below that level, calcium absorption is impaired, as Figure 3 shows. It might be inferred from Figure 3 both that 25(OH)D is itself responsible for directly increasing absorption efficiency and that maximal absorption amounts to approximately 30%. Both are probably incorrect. Even at full vitamin D repletion [i.e., 25(OH)D levels ≥80 nmol/L), absorption fraction may be higher or lower than the plateau level shown in Figure 3, depending solely on calcitriol production, which reflects calcium need. (Calcitriol, in turn, is regulated by parathyroid hormone, itself reacting to perceived calcium need.) Below 80 nmol, absorption depends on both 25(OH)D and calcitriol. Although 25(OH)D has been shown to alter absorption directly (7), the size of that effect is too small to account for the ascending limb of the curve in Figure 3. What Figure 3 shows is not so much what vitamin D does as what it permits. Vitamin D enables the physiologic regulation of absorption so that vitamin D supply is not rate limiting. In one key study (10), participants with 25(OH)D concentrations averaging 86 nmol/L (34 ng/ml) absorbed at nearly 70% higher efficiency than did the same women studied at 50 nmol/L (20 ng/ml). The last published recommendations for vitamin D intake (1) are 200 IU/d for children and for adults up to age 50, 400 IU/d from age 50 to 70, and 600 IU/d thereafter. (The rise in the recommendations with age is an explicit reflection of the fact that, although cutaneous synthesis is understood to be occurring in most individuals, the efficiency of that synthesis declines with age [16,17].) These recommendations are explicitly pegged to the prevention of rickets in children and are presumably adequate for the prevention of osteomalacia in adults but are otherwise unconnected with any of the other disorders or functions reviewed in this article. At the time the recommendations were published, there was no clear evidence of how much vitamin D was typically synthesized in the skin, and, indeed, vitamin D presents a unique challenge among all of the nutrients because it is not typically present in most foods and because people with ample sun exposure have, effectively, no need at all for oral vitamin D.
Quantitative studies performed since the publication of the these recommendations have made it clear that at a presumably optimal level of ≥80 nmol/L, daily metabolic utilization of vitamin D is on the order of 4000 IU (18). Because dietary sources account for typically for no more than 5 to 10% of that total, the rest must be coming from skin or, lacking that, must result in a suboptimal 25(OH)D concentration. Much work is being done (16,19,20) with respect to cutaneous synthesis of vitamin D and its relative role in the total vitamin D economy, but, for the moment, emphasis has to be on the oral supplementation that may be needed to achieve desired serum 25(OH)D concentrations. The quantitative work alluded to previously (18) has resulted in a “rule of thumb” to the effect that each 100 IU of additional daily oral vitamin D intake produces an elevation of serum 25(OH)D of approximately 1 ng/ml (2.5 nmol/L). Thus, a patient with a starting value of 15 ng/ml (37.5 nmol/L) would require approximately 1500 IU/d to bring his or her serum 25(OH)D level up to 30 ng/ml (75 nmol/L). At the same time, it must be stressed that individual response to standard dosages varies widely, and the rule of thumb is only an approximation. Following is a very brief review of some of the chronic disorders in which vitamin D deficiency has been found to play a role, either from epidemiologic studies or from randomized, controlled trials of vitamin D intervention. (A more extensive treatment may be found in Holick's review of that topic .) Table 1 lists several of these disorders with a rough indication for each of the extent and quality of the evidence connecting vitamin D deficiency with risk for or severity of the disorder concerned. Four pluses designate strong evidence including one or more randomized trials; three pluses strong and consistent epidemiologic evidence, without, however, evidence from randomized trials; and one and two pluses designate less strong evidence that is nevertheless suggestive. For some entries (e.g., multiple sclerosis with two pluses), it is not so much that there is contrary evidence as that the studies concerned are few in number. Also, by the same token, the absence of clinical trial data does not mean that there were null trials, so much as that the trials that are needed to confirm a causal connection have not been done. Furthermore, it is worth noting that, in certain instances, such trials might be extremely difficult to conduct (e.g., with a rare disorder such as multiple sclerosis). The role of vitamin D in the pathogenesis and course of osteoporosis involves both its canonical function and the autocrine activity of the vitamin. For the canonical function, facilitation of calcium absorption, it is difficult to dissect apart the respective roles of calcium and vitamin D and probably not relevant, in any case. This is simply because one cannot absorb sufficient calcium from plausible diets unless one has reasonably normal vitamin D status, and, at the same time, one cannot absorb sufficient calcium, no matter what the vitamin D status, if calcium intake itself is absolutely low (22). Hence, given the prevalence of low intakes of both nutrients, it is not surprising that most of the clinical trials showing fracture prevention with calcium supplementation have involved treatment with vitamin D as well. All such trials show protection against age-related bone loss and, in many instances, reduction in fracture risk as well. Where fractures have been reduced, the induced serum 25(OH)D level was in excess of 75 to 80 nmol/L, and dosages that failed to achieve such serum levels generally failed to show fracture reduction (23). In addition, apparently through an autocrine pathway, vitamin D has been shown to reduce fall risk within only a few weeks of starting treatment, in some trials by as much as 50% (24,25). It is likely that this effect is partly responsible for the reduced fracture risk observed in treatment studies. There is a large body of epidemiologic data showing an inverse association between incident cancer risk and antecedently measured serum 25(OH)D (26–29). This evidence has been accumulated for such cancers as prostate, colon, breast, lung, and marrow/lymphoma, among others. Risk reduction for breast cancer, for example, is reported to be as much as 70% for the top quartile of serum 25(OH)D (>75 nmol/L) relative to the bottom quartile (<45 nmol/L) (29). Furthermore, there is an even larger body of animal data showing that vitamin D deficiency in experimental systems predisposes to development of cancer on exposure to typical carcinogens (30,31). This has been shown both for animals with knockout of the vitamin D receptor and for animals with induced, nutritional vitamin D deficiency. Capping these lines of evidence is a recent randomized, controlled trial of postmenopausal women showing substantial reduction in all-cancer risk, amounting to from 60 to 75%, over the course of a 4-yr study (32). 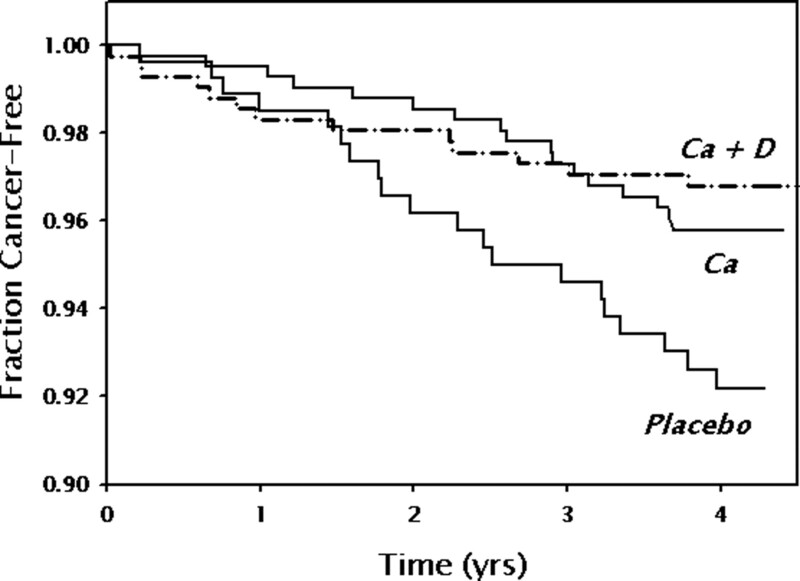 Figure 4 presents the Kaplan-Meier survival curves free of cancer for individuals from that study. In the days when rickets was rampant, children with this disorder frequently died of respiratory infections. Calcitriol in its autocrine role has been recognized for roughly 20 yr as playing a role in various aspects of the immune response (33), best illustrated in the study of Liu et al. (3) for innate immunity. Clinically, it has been noted in randomized, controlled trials that vitamin D co-therapy substantially improved response to standard antitubercular therapy in patients with advanced pulmonary tuberculosis (34) and, as a secondary outcome, reduced risk for influenza in postmenopausal black women who received vitamin D (35). Also, phagocytic function of human macrophages is enhanced in individuals who received vitamin D supplementation (36). In brief, response to infection is hampered when vitamin D status is suboptimal. Both type 1 and type 2 diabetes have been associated with low vitamin D status, both current and antecedent (37–39). For example, in a study based in the National Health and Nutrition Examination Survey (NHANES) data, participants without a known history and/or diagnosis of diabetes were much more likely to have high blood sugar values, both fasting and after a glucose challenge, when they had low vitamin D status (37). In an interesting report from Finland, adults who had received 2000 IU/d vitamin D during the first year of life had an >80% reduction in risk of incident type 1 diabetes, relative to individuals who had not received such supplement (39). The association of vitamin D status and hypertension is particularly strong. Both controlled trials and meta-analyses have shown a protective effect of high calcium intake for both pregnancy-related and essential hypertension (40–44), whereas risk for incident hypertension is inversely related to antecedently measured serum 25(OH)D concentration. Specifically, in a 4-yr prospective study involving both the Health Professionals Follow-up Study and the Nurses’ Health Study, Forman et al. (40) reported a relative risk for incident hypertension of 3.18 for individuals with 25(OH)D levels <15 ng/ml, relative to those with levels >30 ng/ml. From the Framingham Offspring Study, with 5.4 yr of follow-up, individuals with 25(OH)D values <15 ng/ml were 53% more likely to experience a cardiovascular event than those above that level, and those with values <10 ng/ml were 80% more likely (41). Finally, Giovannucci et al. (45), analyzing data from the Health Professionals Follow-up Study, reported a nearly 2.5-fold increase in risk of myocardial infarction for individuals with 25(OH)D levels below 15 ng/mL, compared to those above 30 ng/mL. The natural form of vitamin D in all animals and the form synthesized in human skin on exposure to sunlight is cholecalciferol, vitamin D3. Ergocalciferol (vitamin D2) is a synthetic product derived by irradiation of plant sterols/ergosterol. Until very recently, the two forms of the vitamin were considered to be interchangeable and equivalent (hence their quantification with the same unitage); however, since the availability of the measurement of serum 25(OH)D as an indicator of vitamin D functional status, it has become clear that vitamin D2 is substantially less potent, unit for unit, than vitamin D3 (46,47). The two seem to be absorbed from the intestine and to be 25-hydroxylated in the liver with equal efficiency (47); however, vitamin D2 seems to upregulate several 24-hydroxylases, leading to increased metabolic degradation of both the administered D2 and endogenous D3. Thus, although it is certainly possible to treat patients satisfactorily with vitamin D2 (48), ergocalciferol seems to have no advantage over vitamin D3 (cholecalciferol), which, as noted, is the natural form of the vitamin and which is, today, less expensive. It should be noted that, in this brief review, all of the evidence brought forth with respect to the relationship of vitamin D status to health and disease has been developed mainly for cholecalciferol (vitamin D3). Vitamin D, particularly its active hormonal form, calcitriol, is a highly potent molecule, capable of producing serious toxic effects, including death, at milligram intake levels. There is thus a healthy fear of the compound relating in part to cases of sporadic poisoning (49) as well as to medical misadventure 70 yr ago, involving administration of millions of units per day of the vitamin. Nevertheless, despite these appropriate concerns, there is, in fact, a comfortable margin of safety between the intakes required for optimization of vitamin D status and those associated with toxicity. It is worth noting, for example, that a single minimum erythema dosage of ultraviolet radiation (e.g., 15 min in the sun in a bathing suit in July) produces, in a light-skinned individual, 10,000 to 20,000 IU of vitamin D. Repeated day after day, this can add up to substantial vitamin D inputs. Nevertheless, there has never been a reported case of vitamin D intoxication from sun exposure. Controlled metabolic studies, necessarily limited in scope (although extending into the 100s of individuals), showed that dosages up to 50,000 IU/d for from 1 to 5 mo produce neither hypercalcemia nor hypercalciuria. A recent publication, reviewing the totality of the toxicity data, concluded that there were no cases of intoxication reported for daily intakes of <30,000 IU/d for extended periods (50) and no cases of vitamin D intoxication for serum 25(OH)D levels <200 ng/ml (500 nmol/L). Thus, it was concluded that a daily intake of 10,000 IU should be considered the tolerable upper intake level. There is no known medical reason for dosages approaching that level; hence, there is a comfortable margin of safety between therapeutic and toxic intakes. In the foregoing brief summary, which touched on only a small fraction of a vast body of work that has been developed in this area, several features stand out. Perhaps most important is the pluriform nature of the benefit, involving systems ranging from epithelial carcinogenesis to neuromuscular functioning. This diversity of effect seems to be an expression of the fact that there are roughly 800 human genes for which there is a vitamin D response element (4). Most of these genes have nothing to do with the canonical function of vitamin D (calcium absorption) but instead relate to the expression of proteins necessary for control of cell proliferation, differentiation, and apoptosis. Because these functions are critical for most body tissues, notably epithelial integrity and the immune response, it is perhaps not surprising that inadequate vitamin D availability may limit both the performance of the tissues concerned and their control of various aspects of the cell cycle. A second feature of the list of diseases involved is that they all are multifactorial in origin, and it is likely that vitamin D deficiency, rather than being directly causal (as with rickets and osteomalacia), operates by hampering the ability of the tissues concerned to deal adequately with both physiologic stimuli and pathologic signals. Accordingly, it is likely that medical science does not really know the true, underlying burden of many of these chronic diseases and cannot know it until the widespread problem of vitamin D deficiency has been corrected. Undoubtedly, various cancers, infections, and hip fractures will continue to occur under conditions of optimal vitamin D status. It is just that risk will be lower. This is strongly suggested by the fact that incidence of virtually all of the disorders concerned is directly correlated with latitude, with populations living farther from the equator (with lower cutaneous synthesis of vitamin D) being at greater risk. Also, in the case of patients with ESRD, it is not certain what fraction of their symptom complex is due to the vitamin D deficiency that is widespread in that population. Several randomized, controlled trials are now under way to evaluate the effects, if any, of vitamin D supplementation, and answers to this question should be forthcoming in the relatively near future.